Putting together a well-developed retirement plan presents plenty of challenges — and, unfortunately, plenty of opportunities to make investment mistakes. It's often difficult if not impossible to recover from these goofs, says MoneyWatch Wise Investing blogger Larry Swedroe. In his new book, Wise Investing Made Simpler, Swedroe warns investors to avoid these five big flubs. Historically, the stock market has provided an annualized real rate of return of about 7 percent. So, many investors assume they’ll earn at least that much going forward. While the past is often a good guide to the future, that’s not the case when it comes to forecasting equity returns. The real return provided by stocks comes from three sources: dividends, growth in dividends, and changes in the price-to-earnings (P/E) ratio. But the dividend yield at the end of 2009 was only about half the historical average of about 4.5 percent, which has led most economists to forecast real stock returns in the range of just 4 to 5 percent. So if you’re using 7 percent as a guide in your financial planning, you’ll likely fall short of your goal. A study by Aon Consulting and Georgia State University found that the average person will need to replace between 80 and 90 percent of his preretirement income during retirement. Yet in a retirement confidence survey, one in 10 people said they thought they’d need less than 50 percent, and three in 10 thought they’d need between 50 and 70 percent. Even the 80 to 90 percent figures may be conservative. Many employers are being forced to renege on promises to provide health insurance to their retirees. And given the crisis in the Medicare program, it seems likely that the share of medical costs you’ll have to bear will increase. So plan on needing 100 percent of your preretirement income. This is one of the most common errors people make planning for retirement. Remember, not only are people living longer these days, life expectancy increases as you age. At birth, the average life expectancy of males is 74, but a man who reaches 65 has an average life expectancy of 81. The average life expectancy at birth for females is 79, but it’s 83 for 65-year-old women. Once you enter retirement, the risks of inflation increase, because you can no longer count on rising wages to offset rises in your cost of living. Also, many pension plans aren’t indexed to inflation and most bonds present inflation risk. This is why retired investors should at least consider investing in TIPS (Treasury inflation-protected securities) and I Bonds, another inflation-protected security). These bonds, unlike other bonds, also have negative correlations with equities. By owning TIPS or I Bonds, you reduce the risk of owning stocks. As people enter retirement, they tend to become more conservative investors, gravitating toward safer asset classes. That’s appropriate. But too much of a good (safe) thing may not be such a good thing. After all, there are periods when bonds perform poorly while equities provide higher returns. Also, while the real returns of nominal bonds can be eroded by inflation, equities provide some long-term protection against it. Seeking safer investments can lead you to confuse the familiar with the safe. Since many people are more familiar with U.S. investments than international investments, they wrongly assume that international assets are more risky. Actually, adding international equities to your portfolio reduces your overall risk. So don’t be afraid of owning a low-cost international stock index fund, such as the ones recommended by Burton Malkiel in The Elements of Investing. 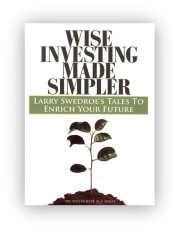 From Wise Investing Made Simpler by Larry Swedroe, © 2010, published by Charter Financial Publishing Network. Are You Making Retirement More Difficult? Larry Swedroe is a principal and the director of research for The BAM ALLIANCE, a community of independent wealth management firms located throughout the United States. He has authored or co-authored 12 books, including his most recent, Think, Act, and Invest Like Warren Buffett. His opinions and comments expressed on this site are his own and may not accurately reflect those of the firm.